too much talk and analysis of the Giants offense for me. I'm tired of rehashing the old arguments, and frankly, surprised we haven't had more substantive discussion about what's happening on defense. This is a good week to look back at and figure out what Bettcher's asking of the defense. First of all, Bettcher doesn't play three 3 DL a lot. Go back and watch the first four drives of the Bears game. You won't see a single snap with more than 2 DL. Not even on the goal line or fourth and short plays. He plays two DL, 3-4 backers (generally) and 5-6 DB's. He even had a snap with 0 DL on the field and 7 of the 10 db's on the roster all on the field at the same time. Having said that - he does ask his players to "play big". What I mean by that is that he has his linebackers regularly playing like DL, regularly with their hands in the dirt but not always. This duty tends to fall to Vernon, Martin, and Barwin. He also has his safeties play in linebacker alignments/looks. For example, Collins is generally lined up in the box like a LB might be. This results in looks that seem like the traditional 3-4 or 4-3, but he's doing it with smaller guys. In other words, he's asking his players to "play bigger" than their traditional assignments might call for. Doing this allows Bettcher's defense to take on multiple looks without substitution. The fronts can go from four guys with their hands in the dirt including some odd spacing like a wide-9 alignment and three down linemen on the opposite side, showing a massive hole between the nose playing over the center and the wide-9 backer. On the back end the secondary easily morphs from a single-high to three-high with every zone look in between. What this requires is for players to play smart and fast and disciplined. You might think that a team like CHI would want to take advantage of the smaller personnel across the LOS, especially when playing a back up QB. They certainly tried early on but generally were unsuccessful. The few successful carries were due to player's lack of discipline in their assignments. For example, OV didn't hold contain and that led to a long run around his end. The same thing happened on their first TD - two DB's on the end both buying the play-action and neither covering the TE on the out. My analysis - it's obvious that Bettcher's defense is very complex and requires players to do different things than they may have in the past due to their position assignments. This first year he's been working through different groups of players learning what they can and can't do. I expect them to continue to improve as the players better understand and buy into the discipline required in a scheme like this and the coaches better understand the limitations and abilities of their players. Having said that, it's easy to see why the defense can tire down late in games as Bettcher is asking them to take on much bigger players regularly. You can see them quickly tiring as drives extend and games lengthen. A strong clock-eating offense will really help a defense like Bettcher's. I still like Bettcher a lot. But it is so hard to get a read on his defense with so little talent available. In order or run a good 3-4 defense, you need good LBs. You can argue that right now, the Giants have MAYBE one average one in Ogeltree. OV is a 4-3 DE playing a 3-4 OLB. Barwin is washed. Carter has talent, but is still learning the pro game and playing underweight. Goodson is a 4-3 MLB at best, and he can't run for crap. They also do not have a true NT, as Tomlinson seems more like a 3-4 DE. Ditto with BJ Hill, RJ McIntosh, Josh Mauro, and Mario Edwards. They have no coverage LBs or FS to cover TEs and/or RBs. This forces Bettcher to use Collins in situations he is not suited for. I think once this team gets a pass rusher, better LBs, even an average FS, and a NT, you will see what Bettcher's defense can really do. The good part to what is happening this year is that I think it will force Bettcher to stay at least one more year. He was rumored to be someone who had "Future Coach" ability. I think he stays at least 1-2 more years now, gets his players in is system with a base of players that know the system next year, and we will see him put together much better defenses going forward. I am referring to a player who sometimes gets an immediate win, and will eventually always beat his man. Vernon is supposed to provide this, but is either out or playing hurt all the time. Martin, I believe was supposed to mature into this, but that has not happened. So, most the time, opposition QBs look too comfortable against this D.
I agree with most of what you say. Not sure what to think about the true NT. Tomlinson has actually played pretty well at the nose. His role there is to take on the double-teams he draws, so you shouldn't expect him to make many plays. More importantly, most of the time the Giants seem to be showing more 4-3 looks in their front than 3-4. The result is that the DT's are playing more 3-tech than 0 or 1. Whether that's due to his scheme and preference, or Bettcher making the most out of the players on his roster remains tbd. We'll see if they go after a true NT in the offseason and then how often they play that position. That, and the amount of blitzing he's one is way down this year to years past. I don't know if that's because the blitzes weren't getting home early or if he's preferring to keep QB's in the pocket and depend on his coverages in the secondary. Again, it will be interesting to see how they build the defensive roster next year. the secondary is good enough and they are creating turnovers. If we added just one dominant pass rusher and one run stopper like Snacks was when we first got him, then this defense would be top 5.
have better talent and wayyy worse results. I give betcher a pass and excited to see what he would do with more talent. Being officially a DE in a 3-4 they might have wanted emphasis on more quickness and flexibility over strength. I believe that knowing that he is playing inside next year, he will be fine. The banging a square peg in a round hole was having him play outside. My eyes are telling me he's a good defensive coach trying to scheme around a pretty serious lack of talent. I like a lot of things I've seen from him and think with some better players here, he'll be able to field a pretty good unit. Oddly enough, the Giants had a true NT and traded him for a 5th round pick. RE: I still like Bettcher a lot. I think it's a complete misnomer to call this defense a 3-4 and complain about a lack of a NT. This defense would best be called a 2-4. The fronts he's using are as often a 4-3 as a 3-4. Here's a picture showing a traditional 3-4 defense. Now there's all kinds of defensive alignments in a base 3-4 defense, but let's focus on one thing they all have in common. There's a NT and 2 ends. Watch Bettcher's defense and you won't see that. You sometimes see a defender (usually Tomlinson or Edwards) lining up like a nose) but you won't see a traditional end on both sides very often. You generally see a LOT more looks like this. So looking at this front, you see a Nose and Tackle position, generally run by some combination of Tomlinson/Hill, or Tomlinson/Wynn, or Edwards/Mauro, etc. The ends are usually our LBers, generally OV/Martin, or OV/Barwin. The Mike and Will backers are usually Ogletree and either Tae Davis or Goodson/Stupar/Eligwe. The Sam backer is usually Collins. So we don't really see ANY 3-4 fronts, where you might expect to see DT at the nose with Hill on one side and Mauro/Wynn on the other. Not even in fourth and short or goal line. Bettcher's just not doing it. Certainly he can integrate great defensive players, DTs if he has them, all types including NTs, but certainly could also use a great "4/3 type three tech pentrating DT"
... True free safeties (drafted high) and any and all types of defensive backs. Quickly into and through those gaps in the priscribed manner as opposed to react. cause havoc would help immensely. Additionally, although you say a NT is not quite a NT, as we know it, in a standard 3-4 defense, I think a guy that can anchor the middle would help as well. Whether you call him a NT or DT, a guy that will not get pushed around, a guy that can anchor the middle and not get blocked out of the play, would also help. You need ILBs that can play the run, as well. 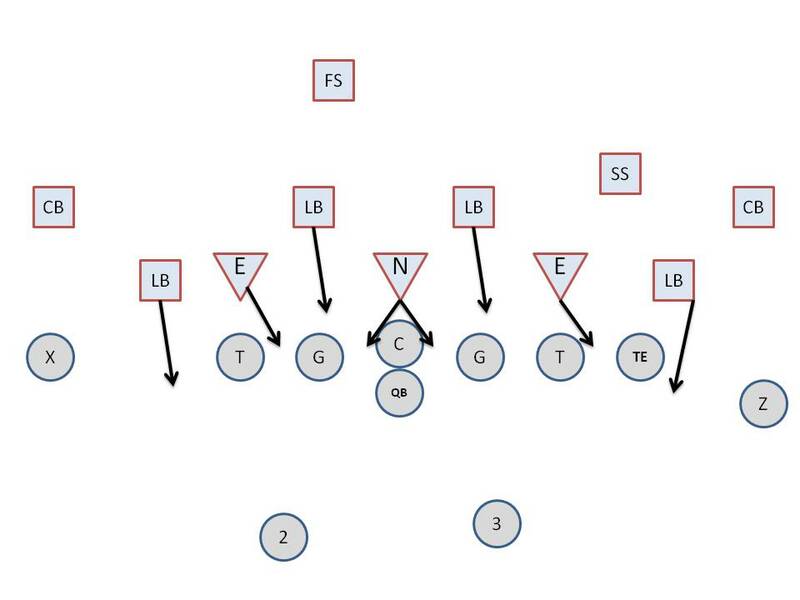 In a 3-4 D, when the team goes nickel or dime, they go to a 2-4 or 3-3, subbing a DL or LB for a DB respectively. Or 1-4 in dime. 4-3 almost always subs a LB for a DB, going 4-2 or 4-1. So Giants are more or less a 3-4. Don�t see how you can love this defense, it�s been basically awful with zero pass rush. The blitz packages seem totally inept and basically never get there. When they have played a good team they are overmatched and have only been effective against bad teams and backup QBs. I think webare setting a pretty low bar to be happy with the job they have done on D.
Yep. I'm just going through the games looking for an alignment that is NOT nickel or dime. Haven't really seen any in a while. Maybe I'm missing it. Bringing this topic up because it's something I thought more interesting than the endless debates on Eli/OL/HC etc. and because I read commentary about NT from time to time, but I don't really see us using a NT. Busy now but going to go back through the film prior to trading Snacks to see how often we were NOT in nickel or dime. A true base 3-4 defense is what we are in name, but not seeing it really on the field. I very rarely see application of a 3-4 during games - it's mostly a 4-3 look. Once in a while they will line up Tomlinson over the center, but most of the time it's a 4-3 look, from what i've seen. Of the philosophy and it,s application. We don,t WIN tthe matchups the defense by design creates often enough. a 3/4 Def coach, when you don't have 3/4 personnel? Because our 4-3 personnel wasn't any better and this is the direction we've decided to go in. Not that complicated. I'm interested in knowing how often we were in a base before we dealt Harrison and whether or not Bettcher was using 3 down linemen more often. I hadn't really zeroed in on that.